After selecting the perfect cut of meat, you scour the web for the most mouth-watering recipe. Plan the seating arrangements and set the table with your very best dinnerware. Rise early to begin the roast, basting and anxiously checking its progress. You hope this works out as well as you imagined . Finally, your guests arrive. It’s go time. You make your entry from the kitchen…. triumphant. You’ve successfully prepared the most succulent-looking, deliciously juicy-smelling roast. Ever. The guests ‘ooh’ and ‘aah’ in appreciative anticipation. Glancing over at your new mother-in-law you notice that her eyebrows are raised a little. Clearly, she is surprised. She didn’t think you could pull this off. And, then you begin to carve. No, this can’t be happening. You can’t slice the meat. But you’ve watched a YouTube video on this. It’s supposed to be easy. What’s your mother-in-law going to think now? This is not how it was supposed to be. The roast is so perfect. Stop. Your old carving knife is useless if you don’t maintain its edge. If you’re not into sharpening knives, we have the solution. You need an electric carving knife in your life. Granted, they aren’t elegant sushi knives… but they slice through almost anything without drama. Here are a few electric knives that will give you carving skills that rival the pros. How Do Electric Carving Knives Work? 1. Can an electric knife cut through bone? 2. 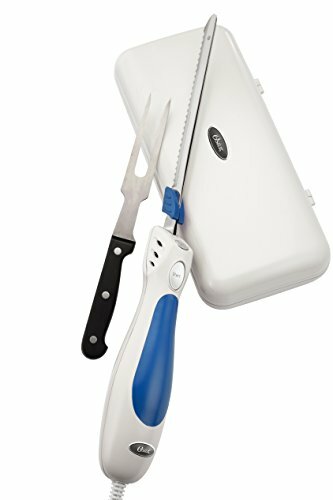 What are electric knives used for? 4. How do you sharpen an electric knife blade? 5. Who makes the best electric knife? 6. Who invented the electric knife? 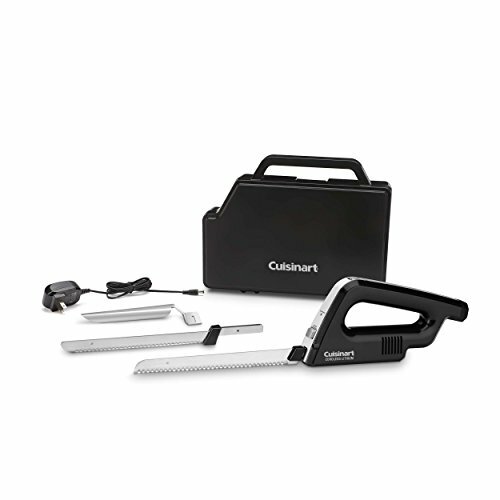 Available in corded and cordless, electric carving knives often do a better job of slicing than a traditional carving knife. This is due to the design of the unique blades. Yes, there are two blades, set very close together. An electric motor moves the serrated blades in opposite directions. This allows them to move through food without pulling and tearing, leaving you with neater, cleaner, more precise slices. 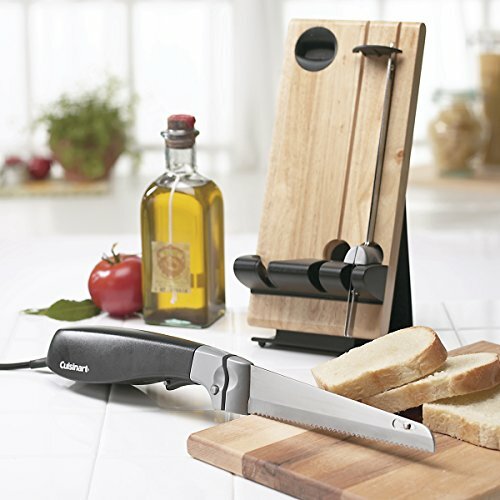 Most people find that their electric carving knives work best when they simply relax and let the blade do its thing. Pressing down in an effort to speed things up is, for the most part, counterproductive. Being impatient leads to the overheating, and the disheveled slices of meat. Slow down for the best results. This might be the best electric knife available. In fact it is a bestseller. With a great combination of price, performance, and a 3 year warranty, it’s easy to see why. The CEK40 is also a good looking knife, and it comes with an attractive, solid wood, butchers block stand. You can display this on the countertop by flipping out the stand, or fold it flat to place in a drawer. The ergonomic one piece handle allows you to cut with precision, whether you are left or right handed. 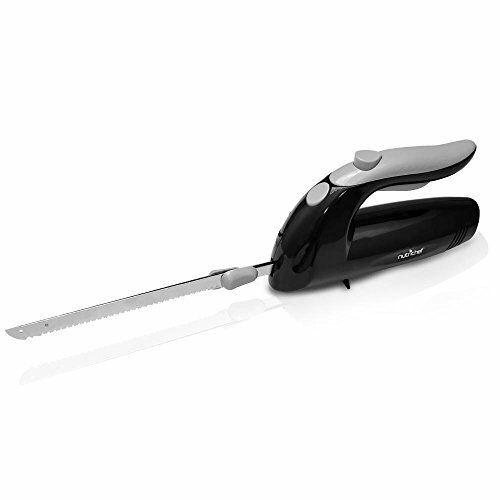 The CEK40 includes two interchangeable stainless steel blades for meat or bread. A simple push button system lets you change and wash blades easily, while a safety lock switch prevents accidents. A different handle design to the previous knife makes this Nutrichef model easier to hold for smaller, aging, or weaker hands. The on/off push button is within easy reach and users with grip problems find this knife comfortable to use. There is a good-sized bread and meat blade included, and a handy blade cover so you can rummage in your drawers without fearing for your fingers. This knife is ideal for everyday use in the kitchen. If you’re on a tight budget this might be the best electric knife for you. This is a cordless knife, so if you want to carve right at the table you can (although we’d recommend sticking to behind the scenes – where there’s less pressure). The lithium-ion battery can be recharged to allow for hours of portable carving. A heavy duty brushless motor and stainless steel blades will power through even the most badly cooked offering, and we are reliably informed that even frozen bread is no problem. If you use the included slicing guide, you’ll have perfectly uniform slices, too. A safety lock prevents the blade operating unexpectedly, and a carry case will keep everything tidy when you’re done. But the feature we like best on this knife? An LED for when you do a bit of candlelit carving. Cuisinart have thought of everything. This knife comes with the shortest cutting blade of our selection – with a cutting edge of about 7 inches. However, this blade features a tip specially designed to get into those hard to reach places, allowing you to make use of every last delicious morsel. The one piece handle design comes with a pressure sensitive button to switch on the blade. This knife set includes a carving fork, so you get the complete carving package in one hit. A one year warranty will get you through the years festivities in perfect carving style, and at this price you can buy the family one each so Thanksgiving doesn’t always have to be at your house. A neat storage case holds this knife and its accessories ready for your next meal. The blade included will slice through meats and bread with ease. There is also a dishwasher-safe carving fork included, so you’ll have everything you need (except the meat) to get carving right away. The Hamilton Beach electric knife has an ergonomic one piece handle, with an easy to operate non-slip, trigger-style button. Stainless steel blades will stay sharp for many, many roasts – and can be easily removed for hand washing after use. 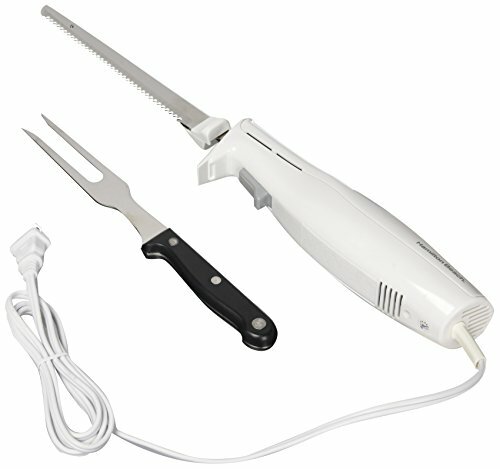 Don’t think that turkey, ham and bread are the only things your electric carving knife is good for. These knives are way more versatile than you might believe. If the weather is way too hot for a roast, try slicing melons. They’re a quick, refreshing and healthy snack that is easy prepared with an electric knife. Pineapples are a breeze, too. Zucchini, squash, and even hard cheeses can all be tamed with an electric carving knife. On special occasions an electric knife will make short work of awkward-to-cut foods like ice cream cake or anything with different textured layers. And if you want to get really creative, these knives are even great for cutting through styrofoam. Just don’t eat that. Generally speaking… no an electric knife is not able to cut through a bone. At least not a bone that you’d be asking about. Sure it can plow through a delicate fish bone or something like that. However… a bone in a roast or a drumstick will stop a electric knife in its tracks. And that’s not a bad thing. Think about sawing through a huge bone in a pork shoulder – after its cooked. You’d have bone fragments, marrow, etc. everywhere. So in that respect; it’s a great thing that these tools cannot cut through bone. Electric knives are great for cutting through large pieces of cooked meat. From prime rib roasts to that Thanksgiving turkey an electric knife will make short work of anything big and meaty. But, they can also be used for things other than meat. We used the test knives to “saw” through bread. So and electric knife will work pretty well on a hunk of meat like brisket. However, we actually prefer a very sharp and large kitchen knife. The electric knife is great for people who don’t sharpen their knives regularly; or for people with limited strength. But, at the end of the day a well sharpened large kitchen knife is the clear choice. First, remove the blades from the body. Next use an electric belt knife sharpener on the flat side of the blade. This is the side that touches the other blade. Do not try to sharpen the scallops in the serrations. You also want to avoid pressing too hard. Doing so will put a convex bevel on the blade. And if there’s anywhere you don’t want this its on a tool that relies on tight tolerances between to blades to cut. Any of the brands and models we mentioned above are excellent options. When it comes to knives like these, there isn’t a huge difference in quality like you’ll see between a $10 sushi knife and one that costs $3,000. Our current favorite is the Cuisinart CEK40. It looks nice, works well, and has a great reputation. As with any invention the “inventor” is a very debatable subject. And, the electric knife is no different. Generally, speaking Jerome L Murray is the inventor that people site most often. However, in the first page of the patent (below) you will see that Clem E Kosterman submitted a patent back in 1939.